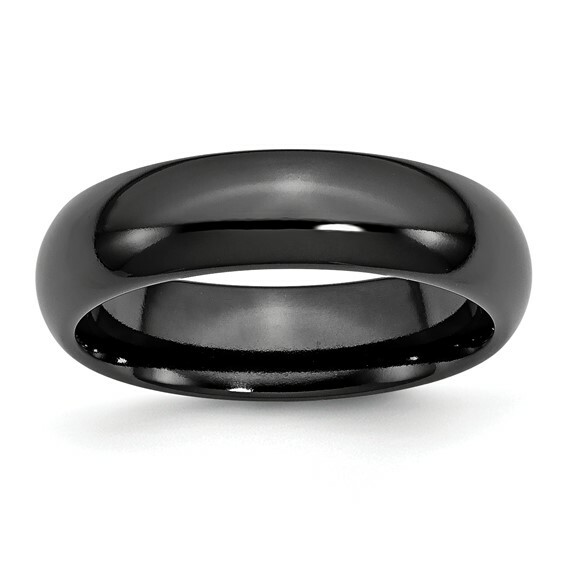 This polished domed 6mm titanium wedding band is made of Black Ti. Comfort fit, made in the USA. Each ring in the Black Ti collection possesses the same benefit as gray titanium. Black Ti is the only non-coated, completely nickel-free and inert titanium alloy that can be processed to black. Black Ti was created through extensive research and development in blending titanium with other strategic elements. Black Ti is a proprietary alloy which miraculously experiences an atomic transformation at the molecular level to become ceramic, turning the titanium black from the outside in by exposing the element to extreme heat. The severe hardness created through this unique process yields a supremely scratch resistant surface.